Most of us must find intersection of two linear straight lines with pen and paper during school days. In this article, we will see how to solve it with Excel. First we need the equations of the two lines. Let the point of intersection be s and t. They must satisfy the above 2 equations. 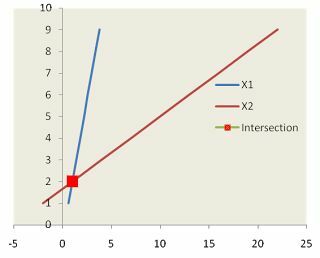 Use SLOPE and INTERCEPT functions to replicate these equations in excel. Based on the above equations i created data for y1 and y2 using same values on X1. 6 Responses to "Excel : Intersection of two linear straight lines"
Let say i have a sinusoidal equation, y = A sin wt and a straight line equation, y = mt + c. how do i determine the intersection between those graphs? Sorry, I am slow and got little from it. Perhaps, some practical examples would help. I have home with a roof with a 6:12 slope. I want to add a porch with a 4:12 slope. The porch (with eave) is 11.5 feet wide. How long will the rafter be from the porch's eave up the main roof to the interception point? Hi, sir please tell us about yourself. Thanks a lot for this website.